Page CXVI have created modern version of classic Christian Hymns, and are currently giving away lots of their album free. 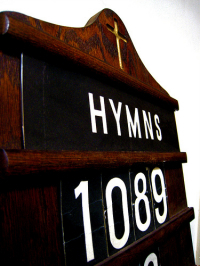 The aim behind Page CXVI is to make hymns accessible and known again. As they point out “Christian Hymns are some of the richest, most meaningful, and moving pieces of music written”, so this is an exciting project! It is also worth noting that the music is provided on an attribution non-commercial creative commons license for all of the public domain music (i.e. the four hymns above). Therefore if you ever want to use any of these songs in videos for your church or other types of media presentations feel the freedom to do so license free. I’d like the sheet music for the hymn “How Great Thou Art” arranged for congregational singing. Thanks! I am the lover of hymn. also the Music Director of my church – All Saints Anglican Church, Mabayoje Stree, Oshodi – Lagos, Nigeria. I came across your site today and i hope I can be a member. I was recommended this website by way of my cousin. I’m no longer sure whether this post is written by him as no one else realize such unique approximately my difficulty. You are wonderful! Thank you!